One of the most famous collections of ancient tales is Alf Layla wa Layla, the Arabic name of One Thousand and One Nights, commonly known in English as The Arabian Nights. The original Arabic compiler is reputedly the 9th century storyteller Abu abd-Allah Muhammed el-Gahshigar. These stories came to Europe during the Middle Ages, but were not written down in a European language until the beginning of the 18th century, when Antoine Galland a French orientalist, translated them into his own language. Translations into English by Edward Lane and Sir Richard Burton followed in the 19th century. Sources dating to the 10th century AD which mention this collection allude to the existence of a Persian book called Hezar Afsaneh (The Book of a Thousand Tales), the story of a king, his vizier, and the vizier's daughters Shahrazad and Dinazad. These same characters appear in the story that frames One Thousand and One Nights, though here the main plot is built around two brothers, the Sassanian kings Shahzaman and Shahriyar, one of whom rules in Samarkand and the other in India and China. Both find out that their wives have been unfaithful, and all the women and slaves involved in their affairs are beheaded. Shahriyar, then gives his vizier (meaning minister in Persian) an order to find him a new wife every night (in some versions, every third night). After spending one night with his bride, the king has her executed at dawn. This practice continues for some time, until the vizier's clever daughter Shahrazad (better-known in English as "Scheherazade") forms a plan to become Shahriyar's next wife. She persuades her father to let her go to the king, taking her younger sister Dinazad with her. After their marriage, she instructs Dinazad to ask her for a story every night. She spends hours telling her sister and the king stories, and each time she stops by dawn, at a crucial point, thereby arousing the king's interest in hearing the rest of the story the following night. She is then able to make them last for one thousand and one nights. During this period Shahrazad gives birth to three male children by the king, and when her storytelling finally ends he offers to grant her a wish. She asks the king to spare her life for the sake of their young children, which he willingly agrees to do, and they live happily ever after. The names of Shahriyar (holder of a kingdom; prince or king), Shahrazad (of noble lineage) and Dinazad (exalting the goddess Den) are Iranian, and the name of Shahriyar's brother Shahzaman consists of the Persian shah (king) and Arabic zaman (time). It is believed that the frame story of One Thousand and One Nights is of both Persian and Indian origin. The tales vary widely; they include historical tales, love stories, tragedies, comedies, poems, burlesques and Muslim religious legends. 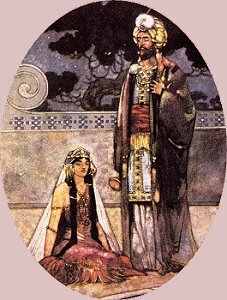 Some of the famous stories Shahrazad spins in many western translations are Aladdin's Lamp, Sindbad the Sailor, and the tale of Ali Baba and the Forty Thieves; however Aladdin and Ali Baba were in fact inserted only in the 18th century by Antoine Galland, who had heard them in oral form from a Maronite story-teller from Aleppo. Among the tales in the collection which are believed to be of Persian origin are love stories and fairy tales, which often include div (demon) and pari (fairy), as well as magical animals and birds. Other stories, such as The Ebony Horse, although beginning with a description which fits perfectly into the Persian tradition, are nevertheless believed to be of Indian origin. The Ebony Horse, also known as The Magic Horse, is about a magical horse presented as a gift to the king of Persia. The king's young heir sits on the ebony horse to test the magic and flies into the sky. He visits another country (Yemen), falls in love with a princess, and after a series of adventures returns to his father's court and marries the princess. Numerous stories depict djinns, magicians, and legendary places, which are often intermingled with real people and geography; the historical caliph Harun al-Rashid is a common protagonist. Sometimes a character in Shahrazad's's tale will begin telling other characters a story of his own, and that story may have another one told within it, and so on, adding to the fantastic texture.